Installing a photovoltaic system requires a sizeable investment, even after the huge drop in costs over the last few years. If your bank account can’t take the hit, you’ll need to seek out financing. Several options are available, but you may be wondering — is going solar really worth the effort and expense? Absolutely! In fact, installing solar panels is a great way for homeowners to save big while reducing their dependence on the power grid. First, let’s talk costs. The average home solar power installation comes in at around $25,000. Some homeowners worry that they won’t recoup their costs. Fortunately, you don’t have to spend that much. The federal solar tax credit cuts the cost of your system by 30 percent. That’s nearly $8,000 right back in your pocket. Add state and local grants, rebates and tax breaks, and you’re potentially looking at thousands more in savings. Altogether, you may be able to save 50 percent or more on your solar installation, and you’ll end up with a source of free electricity. The sun’s energy is free, which translates into instant savings on your electricity bills. It doesn’t matter whether you install a small solar array to provide part of your home’s power or a full-sized photovoltaic system capable of supplying all of your electricity. Any amount of PV energy will slash your utility costs. And if your solar array creates more electricity than your home needs, the utility company will give you a credit for the excess energy you send back up the grid. Because of this, your photovoltaic system could actually end up turning a profit. How’s an extra $15,000 sound? That’s how much more you may be able to get when selling your home if it has photovoltaic power. So the boost to your home value could potentially cover the entire cost of your solar array. Plus, you may not have to worry about your home languishing in the real estate market for long, if you install a photovoltaic energy system. Research from the U.S. Department of Energy Efficiency and Renewable Energy shows that homes with photovoltaic systems often sell twice as fast as those without. As you can see, going solar is definitely worth it. To learn how solar can pay off for you, contact Intermountain Wind & Solar. We serve customers in Utah, Wyoming, Idaho, Nevada and Colorado, and we look forward to helping you save big with photovoltaic energy. Recently, IWS donated a complete 10 kW solar energy system to the South Davis Recovery Club in Bountiful, Utah, which provides critical recovery services to area residents battling alcoholism and addiction. Utah ranks No. 4 in the United States for drug overdose deaths. Last year, more than 365 people—one person per day— died in our state, as the result of a drug overdose. The Utah Department of Health cites chronic and binge drinking as widespread health concerns, and the number of drunken driving deaths doubled in our state last year. The compassionate services South Davis Recovery Club provides have never been more important for Utah. The South Davis Recovery Club is a nonprofit dedicated to helping people with addictions to alcohol and other substances. Members share their experience, strength and hope, and find support for continuous recovery and personal growth by coming to understand that they can join hands with others to accomplish that which they cannot do alone. Mark Richards, senior vice president of Commercial Development at IWS, recommended donating the system and provided coordination for the project. Over the course of two years, Mark and IWS developed a strategy to pay for the photovoltaic energy system to help offset the center’s electrical costs. Finally, this past October, all of this hard work and planning paid off. On Oct. 14, 2016, IWS installed a 9.88 kW PV solar energy system at the Recovery Club. The system consisted of 39 SunEdison 360-watt panels, paired with SMA string inverters. Intermountain Wind & Solar donated the solar panels, inverters and all the required mounting hardware and equipment. The company also donated all of the labor for installing the solar energy array and rewiring the building to accommodate the new photovoltaic system. We’re sharing this information with the community to encourage other local businesses to give back whenever and wherever possible. Together, we can make a difference for our communities and our neighbors. Intermountain Wind & Solar is also dedicated to improving the lives of our customers through renewable energy. We help commercial and residential customers throughout the Intermountain West to reduce or eliminate their dependence on municipal electricity and the onerous costs that accompany it. Contact us today to learn more about our company and the many benefits of solar energy. Intermountain Wind & Solar Named No. 1 Utah Solar Installer! IWS is Utah’s leader in the solar revolution, and we are proud to announce another milestone: We are the only Utah rooftop solar contractor to have installed more than 20 megawatts of solar power! This comes on the heels of having been named last year’s top Utah solar installer — and one of the top 100 solar companies in the nation — by Solar Power World. And based on this year’s growth, we’ve outdone ourselves once again. As of this writing, we have installed 21,880,275 watts of solar power … almost 22 megawatts. That’s more than 85,800 solar panels! Intermountain Wind & Solar is the largest, most well-known commercial and residential solar installer in the Intermountain West. Renewable, alternative energy is not only our area of expertise — it’s all we do. We’re dedicated to making photovoltaic energy systems available to every customer who wants the energy independence and significant cost savings that only photovoltaic power can offer. In business in Utah since 2008, we are locally owned and operated. Our commitment to our customers and our community shows in every system we install. Unlike many of our largest competitors, IWS performs all of our installations ourselves, with our own employees. We don’t outsource any of our work, and that means the buck stops here. We are proud to employ the best solar installers and electricians to ensure that you always receive a highly personalized level of exceptional customer service. This also ensures the quality of every photovoltaic panel array we install. But you don’t have to take our word for it. Our customer reviews and testimonials speak for themselves. In fact, our expert team is often called on to train inspectors and other industry professionals. Our expertise has earned us the trust of countless clients, including Ikea, eBay, Utah’s Army National Guard, USU, Salt Lake County, the U.S. Fish & Wildlife Service and dozens of others. We don’t need high-pressure sales pitches at IWS, because our value speaks for itself. We prefer to educate our customers about the benefits of renewable energy and let you decide for yourself. Thanks to our volume and bulk purchasing programs, we consistently provide the lowest per-watt cost available today. We can assist you in selecting the best financing program for you as well as all available rebates and incentives, including the federal solar tax credit. Not only can we help reduce or eliminate your out-of-pocket costs, but we can also ensure that you have the best possible return on investment for your photovoltaic energy system. Here at Intermountain Wind & Solar, we are proud of our accomplishments. But we won’t rest until we have brought clean, affordable photovoltaic energy to every Intermountain West homeowner and commercial client who wants the advantages that only solar energy can provide. Can You Waste Solar Power? To most of us, solar power is synonymous with energy efficiency. After all, the sun’s energy is virtually limitless, and sunlight doesn’t have to be mined or pumped from the ground. Plus, using the sun to create electricity doesn’t create harmful emissions or toxic byproducts that attract onerous governmental regulation. That said, solar energy can still be wasted, although not on an end-user level. Today, the only area where waste is a challenge for photovoltaic power systems involves — surprise — U.S. government-guided infrastructure. In the U.S., building solar farms in the plains and deserts is cost-effective. The land is inexpensive, and government tax credits, rebates and grants encourage growth in these areas. But though the photovoltaic installations themselves are inexpensive, transmission lines to distribute solar power are not. In fact, distribution components are not typically eligible for financial incentives. As a result, the United States has seen extensive investment in solar farms, but much less development on the transmission end. Consequently, our photovoltaic power systems sometimes produce more electricity than the grid can handle. Whenever that happens, energy production must be curtailed, or turned off completely. For example, one Tuesday last July, grid operators in California had to curtail 292 megawatt hours of solar electricity because they had no way to transmit it to users. Better financial incentives for solar power distribution can certainly help, but the solution to this type of energy waste may lie in technological development. More robust lines that can transmit electricity over greater distances is one way to ensure that our country can use all of the photovoltaic energy it produces. Reconfiguring the national power grid design in some areas may also help. The Texas utility grid, for example, is not currently connected to power grids in neighboring states. Larger investments in the storage market can also help to resolve the solar energy waste problem. With the adoption of better storage technologies, the excess photovoltaic power could be held until the utility grid has room for its transmission. Can You Avoid Energy Waste with Your Solar Power System? As we pointed out above, solar waste is not generally an issue for the end-user, unless your local utility company has an issue. If your photovoltaic array is connected to the utility grid, and if it produces more electricity than your household needs, the excess isn’t typically wasted. Instead, it is sent back to the grid, and the utility company issues you net metering credits. If the utility company and local grid reach transmission capacity, however, your excess power may indeed go to waste. To avoid this, consider investing in a hybrid photovoltaic system. Hybrid systems remain connected to the grid, but they also have battery banks to store excess electricity. You can use energy stored in these batteries whenever you need it, such as in the event of a power outage. Intermountain Wind & Solar has many hybrid PV power options, suitable for commercial and residential applications of all sizes and capacities. Our professional team can design an efficient, waste-free photovoltaic system to power your home or business. Contact us today to schedule your complimentary solar power consultation. Will Solar Panels be Standard in New Homes? Solar panels, much like air conditioning, two-car garages and granite countertops, are quickly becoming a standard feature in new home designs. Consumer demand for photovoltaic power is soaring, and home builders throughout the country are responding by incorporating photovoltaic systems into more new communities. Did you know that home builders in some California cities are required to install photovoltaic arrays? Lancaster was the first city to mandate solar energy systems on new single family homes, back in 2013. Sebastopol quickly followed suit, passing similar legislation. Then in June 2016, two much larger cities, San Francisco and Santa Monica, passed laws that require new homes to include photovoltaic panels. These laws mirror similar statutes that mandate minimum insulation levels and maximum water flow volumes for toilets and showers. Experts believe it’s quite likely that solar mandates will spread to other cities across the country. In a decade or two, we could reach a point where every new home comes complete with photovoltaic panels already in place. California isn’t the only state where photovoltaic panel installations are becoming a standard in new home construction. Home builders in Colorado, Nevada, Arizona, Texas and many other areas of the country already offer solar panels as an option. And for builders in some communities, PV power isn’t an option — it’s a standard feature. Installing a photovoltaic system during the home construction process is cheaper than adding a rooftop solar array later on. Plus, pre-planning allows for optimal rooftop orientation and tilt to capture the maximum amount of solar energy. So photovoltaic power systems that are incorporated into new constructions can be highly cost-effective. Home buyers get excited about solar energy systems because they know that photovoltaic power offers big savings on monthly utility bills. And as new home communities are connected to the utility grid, excess power can be returned to the electricity company if a net metering agreement is in place. Over time, the savings can add up to thousands of dollars, all from a system that requires little maintenance. Buyers can purchase their systems outright in many new communities, with the expenses built in to the construction. However, some home builders offer leases. Leasing is less expensive initially, but the builder retains ownership of the solar panels. That means the builder — not the home buyer — collects the lucrative federal solar tax credit and other government rebates for installing a photovoltaic power system. Fortunately, you don’t have to wait to buy a new home in one of these communities to take advantage of photovoltaic energy. In Utah and the Intermountain West, Intermountain Wind & Solar provides professional installation to both residential and commercial customers. Contact us today to learn more about the significant cost savings and energy independence that solar panels can offer you. Homeowners often install off-grid solar panels to power remote homes and backwoods cabins, but that isn’t the only use for an off-grid system. Why not get one for your workshop or garden shed? If you have an outbuilding that isn’t wired for electricity, it isn’t good for much except storage. Add a solar panel system, though, and the space becomes much more useful — without increasing your monthly utility bills. Photovoltaic power will let you transform an unused space into your own workshop, man cave or she-shed. Where do you work on home improvement projects? If you’re like many of us, you probably have an area carved out in the basement or garage for your workbench and tools. Reclaim that space and turn your garden shed into a workshop instead by installing an off-grid photovoltaic system. Anytime the sun is shining, you’ll be able to work in your shed. You’ll have electricity for power tools, lights, a shop vacuum or whatever you need to get the job done. What if you prefer to work on projects in the evening or on a cloudy day? Your photovoltaic panels need light to produce electricity, so they won’t work during these times. But if you add batteries to store the sun’s energy, you’ll be able to work any time of day or night, regardless of the weather. Speaking of weather, winters in the Intermountain West can be brutally cold. Basement and garage workshops can be rather chilly, and so can garden sheds. By adding photovoltaic panels to the rooftop, you’ll be able to warm the space with an electric space heater. This will allow you to work on home improvement projects in your shed in every season, even in the dead of winter. Is Your Shed Suitable for an Off-Grid Solar System? Before investing in an off-grid system, you’ll need to determine the solar potential of your garden shed. Or, in other words, does the roof get enough sun to provide enough power? Garden sheds don’t typically have their own addresses, so online mapping tools like PVWatts, Google’s Project Sunroof or Mapdwell aren’t going to be helpful in answering that question. You could rent or purchase a shade analysis tool like the Solmetric SunEye or the Solar Pathfinder. Or, for an easier and more accurate rooftop analysis, simply request a professional site evaluation from an experienced photovoltaic contractor like Intermountain Wind & Solar. We offer free, onsite consultations and cost estimates for homeowners throughout the Intermountain West, including Idaho and Utah. Contact us today to learn more about adding off-grid solar panels at your home. Have you considered rooftop solar as a part of your retirement planning? If not, perhaps you should. Achieving your dream of a stable, financially secure retirement will require a mix of smart investments. A rooftop solar system can be one of the most worthwhile retirement investment options available. Oct. 16-22, 2016, is National Save for Retirement Week, a time to think about and work toward a sound financial future. Installing a photovoltaic system can be a solid investment strategy for your retirement. To establish financial security for your retirement, experts recommend investing in low-risk options like government bonds and money market funds. A rooftop solar power system is just such a low-risk investment, as it provides steady, predictable returns. You’ll begin seeing these returns right after installation, as adopting solar will reduce or eliminate your monthly electricity bills. And if your photovoltaic system produces more energy than your household requires, you may even generate credit with the power company, thanks to net metering programs. Eliminating your power bill frees up your cash flow, allowing you to save more for retirement. Plus, investing in rooftop photovoltaic power protects you against future electric company rate hikes. You’ll be creating your own electricity, so you won’t have to budget for increasing utility rates during your retirement. Maybe you aren’t planning on selling your home. But who knows what the future will bring? Adding a photovoltaic system to your home can make it more marketable, which can certainly be beneficial if you decide to downsize or relocate later. Homes with solar energy systems can sell for up to $15,000 more than similar homes without photovoltaic power, according to research from the Lawrence Berkeley National Laboratory. But that’s not their only advantage. A U.S. Department of Energy Efficiency and Renewable Energy study found that solar-powered homes can sell twice as quickly as grid-powered homes. Installing a photovoltaic system can help you save money for retirement, no matter how you finance the purchase. Talk with a financial advisor for guidance specific to your retirement plan, as certain payment options can generate greater returns. If you have the resources, consider paying cash for your rooftop photovoltaic system, as this saves you interest payments. If you don’t have sufficient liquidity, cashing out an investment that has matured can be a great way to reinvest the money toward your retirement. If cash isn’t an option, check into an energy-efficient mortgage, Title I home improvement loan, home equity loan or personal line of credit. Or take advantage of a solar loan through your photovoltaic installation contractor. The alternative energy experts at Intermountain Wind & Solar can design a cost-effective photovoltaic system to power your home and help you save for retirement. Contact us today to learn more or to schedule a free consultation to discuss rooftop solar. Where in the Country Does a Solar Energy System Work Best? every state, some states have better resources than others. Is your state among the most solar-friendly in the U.S.? Are Naturally Sunny States Better for Solar Energy Systems? New Mexico get more sun than most other states. state-level financial incentives for adopting photovoltaic energy vary widely. In some states, rebates, tax credits and grants are quite generous. In others, less so. remarkably similar from state to state, no matter what the local incentives are. PV energy systems as others. Is that a reason to reject photovoltaic energy? efficiently in cooler temperatures, the net production of solar power varies very little. Connecticut and Pennsylvania, none of which would ever be considered a sun-rich state. And as power demands are generally lower in higher latitudes, it all balances out. the incentives and financing options that can make photovoltaic energy work for you. Could Solar Farms Transform the Chernobyl Nuclear Wasteland? Could a new solar farm transform the Chernobyl nuclear site into an abundance of renewable energy? The Chernobyl nuclear plant exploded 30 years ago, and the wasteland is still unsafe for humans and wildlife. Today, however, plans are underway to put the area to use as a solar farm. Scientists say that the land won’t be suitable for living for at least 20,000 years, but the site could work well as a large-scale photovoltaic power station. The Ukrainian government is still in talks with investors, but the first step, installing a four-megawatt solar energy system, should be completed by the end of 2016. Ideally, this innovative photovoltaic concept will become a model for nations around the world. For obvious reasons, the land in Chernobyl comes cheap. The exclusion zone isn’t safe for living, growing food, raising livestock or even logging. But photovoltaic panels can produce safe, free electricity there, despite the contamination. That alone might not mean much, if it weren’t for the other advantages of turning the Chernobyl site into a solar farm. The equipment to transmit electricity is normally expensive to install. But because the area used to house a nuclear power plant, the transmission equipment is already in place. The solar farm concept offers amazing potential for the nearby city of Kiev. With a population of more than 3 million, Kiev has the highest power needs in the Ukraine. If Chernobyl is developed into a solar power plant, it could generate 1,000 megawatts of photovoltaic power, enough to supply low-cost electricity to hundreds of thousands of Kiev residents. Despite the many potential advantages, some residents of the Ukraine feel that the Chernobyl wasteland may not be an ideal site to build a solar farm. The area is still deadly, with dangerously high radiation levels in some areas. Consequently, the photovoltaic contractors installing the solar equipment would have to wear full-body protective suits. Not only would that make it difficult to work, but this gear doesn’t offer protection from gamma radiation. In addition, with the Russian military buildup around Ukraine’s borders, the area is under ongoing threat — a fact some investors find disconcerting. Japan has expanses of unused rice paddies, and a plan is in place to turn many of them into solar farms. Experts estimate that if just 20 percent of these sites are converted, the photovoltaic energy produced could replace the 50 million kilowatts of power Japan’s utility grid generates. In the United States, investors are exploring transforming closed landfills into solar farms. We have thousands of undevelopable closed landfills throughout the country that could be suitable for photovoltaic installations. Cities in several states, including Nevada and Colorado, have already taken steps to turn these unusable spots into solar power plants. On a local level, Intermountain Wind & Solar helps both residential and commercial customers make the easy and cost-effective transition to photovoltaic solar. Contact us today to learn more about how you can put this energy alternative to work for you. And watch your local news to learn more about how the world’s energy landscape is changing, thanks to innovative projects like solar farms. Solar shingles are, essentially, small photovoltaic panels constructed to look and function like conventional roof tiles. These roof tiles are designed to blend in with the rest of your roof, boosting your curb appeal while at the same time providing you with a free source of energy. What’s not to like? As great as they sound, solar roof tiles have several disadvantages. Consequently, they aren’t the best choice for most homeowners. Solar shingles are installed the same as the rest of your roofing tiles. So if your roof doesn’t face south or west and the slope is not ideal, they won’t be oriented for maximum photovoltaic output. Photovoltaic panels, on the other hand, can be mounted on a tilted racking system or on trackers to harness more of the sun’s power. If your roof is unsuitable for photovoltaic panel installation, you’re better off opting for a ground-mounted photovoltaic array than solar shingles. Conventional photovoltaic panels, whether mounted on a rooftop or on the ground, are more efficient than solar roof tiles — and it isn’t only due to orientation. Shingles lay directly on the roof, with no air circulation underneath. As a result, they get much hotter than panels do, and hot solar cells are significantly less efficient at producing electricity. Each solar roof tile or shingle must be wired individually into the array. This creates dozens (or hundreds) of vulnerable points for failure. But more concerning to solar experts is the idea of incorporating an expensive power generation system into a roofing material that isn’t designed to last as long as the solar cell. The reason that traditional photovoltaic panel systems make sense is that they last for decades, through as many re-roofing projects as your home needs. 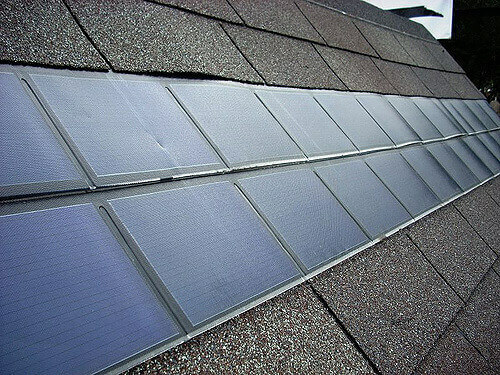 When the roof shingle or tile itself fails, you’re forced to dispose of it – and the solar cell along with it. If you’re in the market for a new roof and you can angle the installation for the maximum amount of photovoltaic output, solar roof tiles could be an option. However, they will cost much more than a traditional photovoltaic panel installation. Why are they so expensive? Installing solar roof tiles requires different training. Essentially, your contractor has to act as both a photovoltaic installer and a roofer. Plus, for warranty coverage, it may be necessary to have a roofer on-site during the photovoltaic installation. That can significantly add to the cost. If you don’t already need a new roof, solar roof tiles probably aren’t the right choice for you. They may be more aesthetically pleasing, but that isn’t usually a worthwhile tradeoff for the increase in cost and decrease in efficiency. Finally, these products may not be available much longer, at least not through mass production processes. Despite making a grand entrance into the renewable energy market in 2010, Dow Chemical announced in July of this year that it had ceased production of its Powerhouse Solar Shingle roofing products. At Intermountain Wind & Solar, our expert team can provide the information you need to determine what type of photovoltaic power system would be the best fit for you. We serve both residential and commercial clients throughout the Intermountain West. Contact us today to learn more about the photovoltaic energy alternatives to solar shingles.